A month ago we were contacted by a very distraught lady who needed to find a special home for one of her horses. The lady breeds top level dressage horses, but on Christmas Eve last year her beloved young Trakhener horse, Accord, got cast in his box and devastatingly injured his vertebrae. Not only was this the sudden end to a promising dressage career, but the situation was worsened by him constantly running around with the other young horses in the field, hindering his recovery and potentially threatening his life. His owner contacted ERF to find her much loved horse a forever home where he could live a quiet life around older, sensible horses….and that’s what we did. There is always a strong risk when a horse’s value drops, through age or injury, that they may fall into the hands of dealers or meatmen. Today Accord went to his new family where he will remain under contract to ERF, thus safeguarding his future for life. 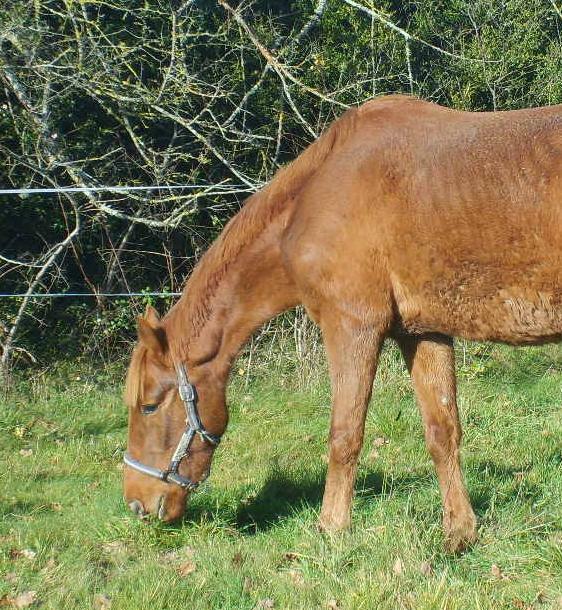 We are thankful to his previous owner for her responsibility and to Accords wonderful new family in the Charente where he can now properly recuperate. He immediately put his head down to eat like he’d been there all his life….at least this Christmas will be a happier one for Accord than last year!